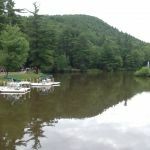 Ask fellow campers about "Gunstock Campground" and nearby attractions. Excellent opportunity for skiing or snowboarding family to winter camp right at the mountain. The roads are plowed as is your site. Plenty of back in sites with warm clean restrooms and a 5 minute walk to the base lodge of the ski resort. The park desperately needs cable TV as there is no over the air TV reception. We camped at Gunstock Campground in a Fifth Wheel. Excellent RV destination for winter camping (as we did). Perfect RV park about 7 minute walk to base lodge for skiing and riding, or very short walk to cross country ski base lodge. Winter camping at Gunstock is lots of fun, the mountain is very family friendly with ski programs for all ages and weekly and weekend promotions for lots of resort products and services. The mountain has excellent grooming, 99% snowmaking, and the trails and glades are for all skill levels. We camped at Gunstock Campground in a Fifth Wheel. They are doing construction and there is a new entrance. Getting in is confusing. At the registration office there is no clear instructions for where to park while registering. We just stopped in the roadway. We were given site A3 but it was not clearly marked. When driving a big rig on narrow dirt roads, clear signs are appreciated. Our site was large but not level. Even with 3 or 4 inches of legos, we slope down hill. Today we may try to change position of our coach. This may not be a problem for more experienced RV'rs. It's a beautiful area and a big campground, scenic but nothing special. We camped at Gunstock Campground in a Motorhome. Mainly hiking, biking and similar outdoor activities are available. We were attending a special event there, so not sure of the normal rates. The campground is very scenic. 15,000 people overloaded the facilities so we cannot judge normal cleanliness. The event was excellent, everything on our site worked well, staff were friendly and we will be back. We camped at Gunstock Campground in a Travel Trailer. Very nice campground at the base of Gunstock ski resort. Gated, nice camp store and pub. No cable and the full hookup site we were in did not have 50 amp service. Large level sites with nice shade or you can dry camp in fields. I will return to this campground, located in the Lakes region of NH. We camped at Gunstock Campground in a Motorhome. Campground is differently a after thought. This sites are normal size. Not many activities to keep the kids busy. This store and pup and game room was nice but the only way to get there easily is to DRIVE the road up to the store was a HUGE HILL and the road is not that level. Would we go back no. This are so many better places. We camped at Gunstock Campground in a Fifth Wheel. Are you affiliated with Gunstock Campground ?